Our soaps are highly moisturizing and mild and also have great cleansing ability and luxurious lather. Using only the finest ingredients we make each batch of soap right in our own kitchen. The oils we most commonly use are olive, sunflower and coconut oils along with shea butter. Our soaps are wrapped in biodegradable shrink wrap to keep their scent as strong the day you open them as the day they were packaged. Only top quality, skin safe colorants and fragrances are used and we always carry unscented and uncolored for those that want it. I partner with other local producers, using their products in the creation of my soaps. The very first on board is Barhop Brewing. 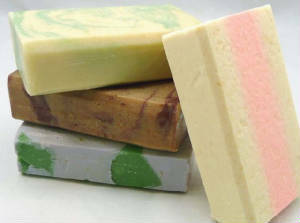 Dungeness Valley Creamery , Harbinger Winery and Silver City Restaurant & Brewery are now also contributing to our soaps. Support these local businesses and give us a mention if you have used their soap. This is an exciting venture and I hope you will check back often to see what's new. Because we care about healthy skin we have a small line of skin care products . Like you, we want the very best for ourselves and our family at a reasonable price. Don't forget to check out our Location page to see our schedule of events, dates and times. We strive to give you a fabulous product for an affordable price.